Please accept my humble obeisances and all glories to our Sampradya Acharya Srila Prabhupada! Please accept a copy of my letter that I had placed on the Sampradaya Sun website. I was very happy that they put my letter on their site but no one answered my questions so I am hoping that on your site someone will. Sep 09, 2010 — MUMBAI, INDIA — Dear Gadadhar das, thank you for writing, prabhuji. Please answer the questions I asked before. All we ever hear is Madhu Pandit’s this, Madhu Pandit’s that. Why not Srila Prabhupada’s ISKCON? 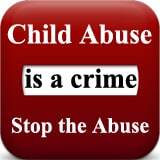 Madhu Pandit needs to speak out against this talking about everything being his. In the newspapers we read ISKCON Bangalore, but hardly do we read glorification of Srila Prabhupada in these reports. If Madhu Pandit is for Srila Prabhupada, he should make definite to everybody that he is working for Srila Prabhupada. Even in Sampradaya Sun, the Sun Correspondent is writing “Criminal Contempt Charges against Members of Madhu Pandit’s GBC“. This is the problem. Madhu Pandit’s GBC. Why his GBC? Why are people thinking like this, and why is he not making this clear? Why does he start his own GBC when he can make more temples and in this way kick out the GBC and have new ones put in? Why start his own? I am not for the ISKCON that he is fighting with, but the ISKCON he is in charge off can be more dangerous, I think, as everyone is thinking that it belongs to him and is Madhu Pandit’s ISKCON. In this way he is worse than the ISKCON GBC and Gurus. Now it is Madhu Pandit’s ISKCON and Madhu Pandit’s GBC and Madhu Pandit’s Ritvik program? 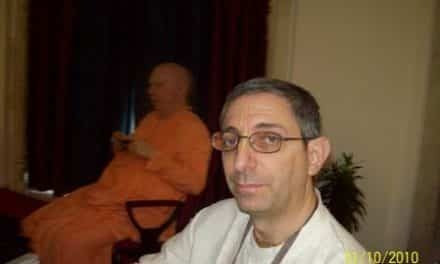 He needs to make his public image better than Radhanath Swami, who is a big cheater, and never gives public praise to Srila Prabhupada. He needs to tell that this is not his ISKCON, his GBC, his anything, only Srila Prabhupada’s. Dealing with Government and politics he needs to be up front about this. Is he trying to trick them by not mentioning Srila Prabhupada? I think they already know he is ISKCON. Then why the big bluffing? This is what I am saying, if people think these are his programs then this is his preaching to everyone, and not Srila Prabhupada’s. This will be his downfall. All people who think they are great like Srila Prabhupada in ISKCON will falldown. If he is a big man, then he will admit that what I am telling is true. The next thing is, why is he speaking up for the government school system? 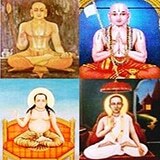 Srila Prabhupada was not for this system and he is saying that this is the answer to India’s problems? This is a big problem in his speaking to the Government and politicians like he has fallen into Maya devi’s trap. The reason why India is having problems is due to us going to these terrible government schools and forgetting our Bharata Varsha traditional education! He is proud of his government education and maybe ashamed with Srila Prabhupada’s program. If he is doing all this for Srila Prabhupada, then he must speak up and say this and prove it to us. All supporters of this program are writing Madhu Pandit’s program is wonderful, as if this will change my mind, but what does Madhu Pandit say? Is this his program, or Srila Prabhupada’s? If he thinks it is Srila Prabhupada’s, then he must keep on making this clear until no one says Madhu Pandit’s this or Madhu Pandit’s that! Then he should stop supporting government schools program and support Bharata Varasha Vedic program! And he could also say that he is distributing ‘Prasadam’ to the little children in schools. No more hiding behind Madhu Pandit’s program, and we will be happy and I think that he will please Srila Prabhupada more. If he is a sincere devotee, he will understand my words. Please forgive me if I am too heavy, but I have had enough of Madhu Pandit’s this and Madhu Pandit’s that. 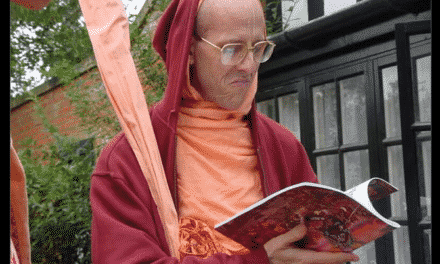 PreviousRadhanath Swami: Charlatan or Saint?